Man oh man, where has the time gone!? I apologize for my brief disappearance but some major things have been going on! The biggest is I’m expecting my first child at the end of October! Very exciting and overwhelming. I spent the first three months feeling under the weather and sleepy which left little time for anything else. So, here I am, 7 months pregnant, and food could not be more important to me right now! Seemed like a good time to get back to it! I hope you’ll come along! My husband and I recently signed up for a CSA (Community Supported Agriculture) here in Chicago and we are loving it! For those of you interested in straight-from-the-farm produce, I highly recommend seeing if there is one in your area. Essentially what happens is a box of food is delivered from a local farm to a house close to where we live. We drive up on Saturday, sign the box out, and take home a beautiful box of fresh, fresh vegetables. We signed up for 12 weeks and the cost ends up being $35/week (how can you beat that!?) The only down side is you have to pay for it all at once…but if you can manage it, it is 100% worth it. …I’m getting sad watching them grow old. So, I have decided to turn these beautiful cucumbers into homemade pickles! The process for making these is super easy! First, cut your cucumbers to whatever size you like. 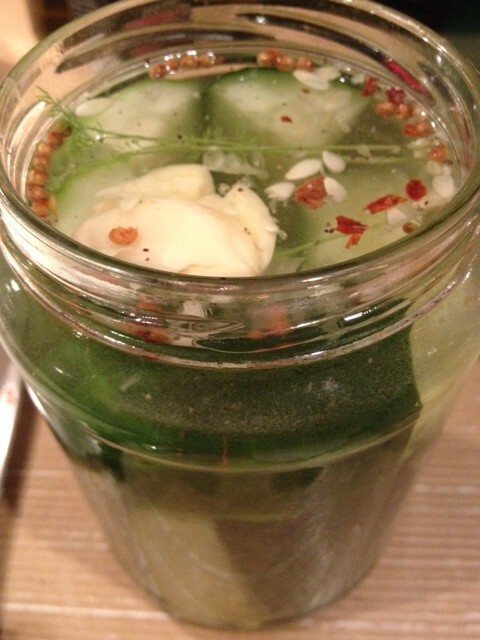 The smaller the pickle, the faster they will ferment and be ready to eat! I did mine in spears! Once cut, put the pickles in the jar. Pack them tight enough so that they won’t float when the water is added. Next, add all the spices on top of the cucumbers! In a separate bowl, mix the water and salt together until the salt dissolves. Pour the water over the pickles, leaving about a 1/2 inch to an inch of space to the top of the jar. One great tip from the original website was to add some chunk of onion on top of the cucumbers. 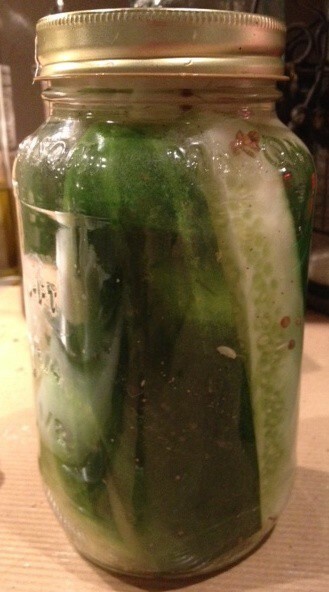 This helps to keep all the cucumbers totally submerged, which is very important! MAKE SURE THE CUCUMBERS ARE COMPLETELY UNDERWATER! 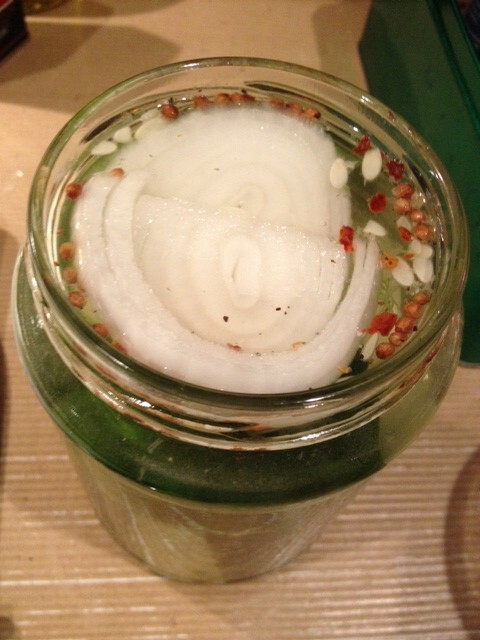 The chunks of onion really do help to push the cucumbers down. Put the lid on the jar and set on the counter. They should be ready in about three days! 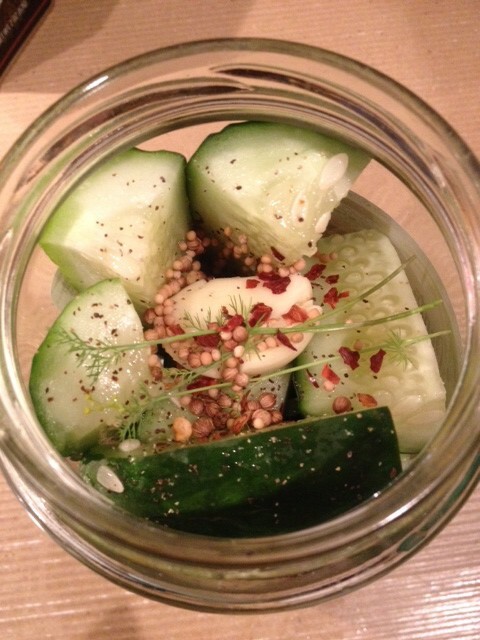 I will continue to post the progress and give my feedback on what I hope are some delicious homemade pickles!